Central Yukon has a sub-Arctic continental climate with long, bitterly cold winters, short mild summers, low relative humidity, and low to moderate precipitation (Table 3). Intrusions of mild air from the Pacific Ocean moderate the climate of the region from the Arctic climate that characterizes northern Yukon . The Dawson Range shares this climate modified by higher elevations. However, higher elevations do not necessarily experience colder temperatures throughout the year. Air temperature decreases with increasing elevation during the summer months but, during the winter, cold air is frequently trapped within the Yukon River Valley and other major valleys causing a temperature inversion . The Dawson Range has a periglacial climate. It is situated within a region of Yukon classified as having extensive discontinuous permafrost . However, the summits of the Dawson Range lie below the regional firn line. Wedge-shaped sedimentary structures, interpreted as the result of thermal-contraction cracking of perennially frozen ground, are convincing evidence for the previous existence of permafrost . These structures are frequently reported from mid-latitudes. Although there is general agreement as to their paleoenvironmental significance, their specific relevance to air temperature is far less clear. Cracking appears to be controlled not only by ground temperature but also by site-specific conditions such as lithology associated thermal conductivity, antecedent conditions, and the duration and thickness of the snow cover. Palaeoclimatological information about cracking and infilling of sand wedges is limited by both a paucity of descriptions of active sand wedges and by differences between past and present environmental conditions . Insufficient data exist on wedge distribution and controls to substantiate the climatic threshold values suggested in the paleoenvironmental literature [22, 26, 73]. Karte  suggests that primary sand-wedge formation indicates a MAAT of -12°C to -20°C and a MAP of < 100 mm. However, primary sand wedges are known to form under somewhat warmer and wetter conditions with abundant sand supply, for example locally on the Tuktoyaktuk Peninsula, Mackenzie Delta area, Canada , where the MAAT at Tuktoyaktuk is -10.9°C and the MAP 138 mm . Sand-wedge polygons were found by Pewe  in the McMurdo Sound Region, Antarctica, where the mean air temperatures is about -17.2°C and annual precipitations are between 50 and 150 mm. More generally, inference of mean annual climatic parameters from cryogenic wedges is problematic because thermal contraction cracking is favored by extreme winter conditions . Recent climate models suggest that the wind systems dominating the Carpathian Basin during marine oxygen isotope stage 2 (MIS 2) were from western to northwestern direction [3, 53]. The reconstructions indicate a dominant westerly to northwesterly wind in winter during the Late Pleniglacial in the central European region . 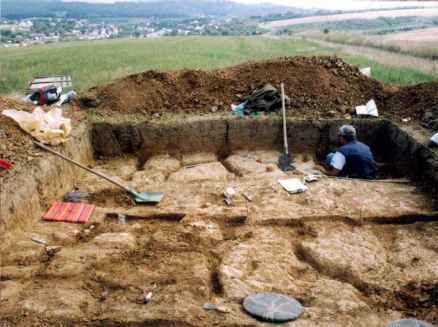 Prolonged periods of intensive wind intensity were recorded in loess deposits in southern Carpathian Basin. These winds were cold and dry. Significant cooling between 22,000 and 18,000 years B.P. was detected based on pollen analyses. Picea and Pinus species became dominant, and mild-climate preferring forms disappeared in this period . As a cryophilous Mollusc, the Columella columella, typically found in tundra or tundra-like environments, was one of the dominant Mollusc elements in this phase. This indicates significant cooling, a cold peak in the Late Pleniglacial and development of the cold loess steppe environment in the Carpathian Basin . The July palaeotemperature decreased to 9-12°C. The Carpathian Basin had a unique climatic situation in the Late Pleniglacial (Dansgaard-Oeschger, between DO 1 and 2 events), as evidenced by the sand wedge formations and palaeoecological investigations. Well-developed soft-sediment structures and wedge-shaped forms were detected in the northern, northwestern part of Hungary that we have interpreted as relict cryogenic forms. Our observations of relict permafrost features support previous inferences [14, 33, 65, 74] for the occurrence of continuous permafrost (which were based on the occurrence of ice-wedge casts and cryoturbations) in Hungary during the Pleistocene. In the Late Pleniglacial the climatic conditions may have been as cold and dry as in modern dry permafrost environments in Canada (MAAT: -8.3°C to -17°C)  and Antarctica [49, 80]. The climate probably was very dry and absolutely cold, favorable for the formation of desert pavement. These characteristics indicate a very arid environment (precipitation < 100 mm, rare snow), a very poor vegetal cover, and very low temperatures (MAAT about -6 to -10°C, ). According to Renssen et al. , the main driving factors behind the anomalous atmospheric circulation in the Late Pleniglacial are the Laurentide Ice Sheet and a colder North Atlantic Ocean with a relatively extensive sea-ice cover, leading to an eastward relocation of the Icelandic Low and an enhanced pressure gradient over northwest Europe, which were caused the extreme cooling of the Carpathian Basin.